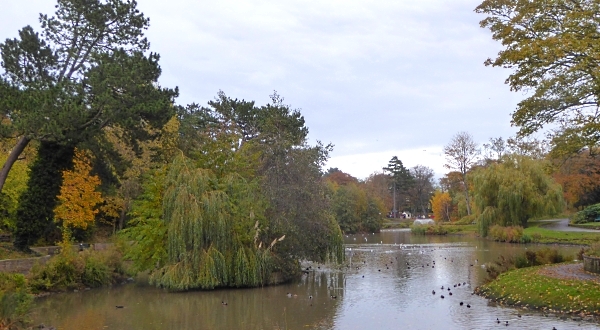 Hesketh Park in Southport is another one of Edward Kemp’s designs, and it was opened in 1868. It features a rather splendid lake and several specialist areas – a Rose Garden, a Sensory Garden and an area of specimen trees. We didn’t see any small birds all day, but may have heard a Robin singing from the deep shade of some evergreens. 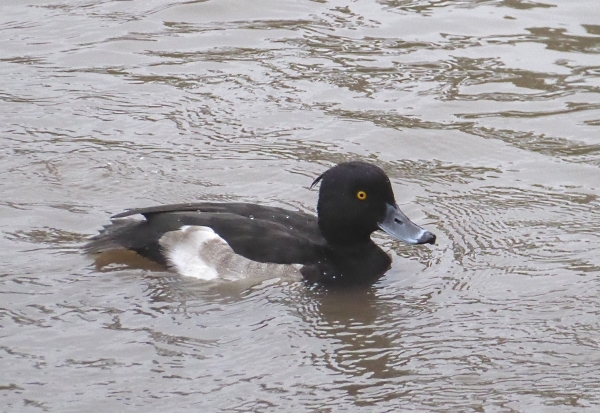 However, the lake had the expected Mallards, Coots and Moorhen, together with Black-headed Gulls and a dozen or so Tufted Duck. 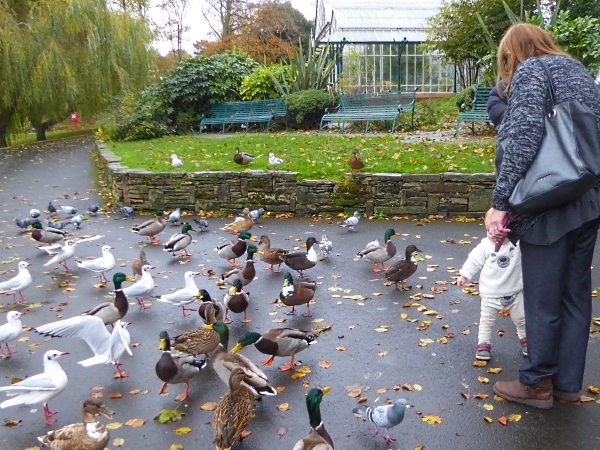 A family was introducing their youngest to the pleasures of “feeding the ducks”, but with stale bread, regrettably. 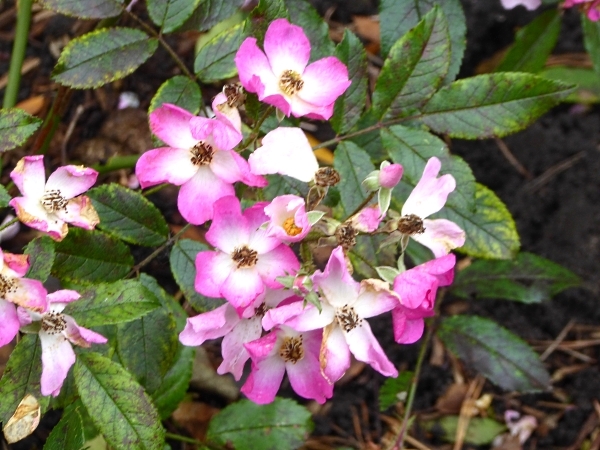 The Rose Garden will be beautiful in summer, with a sign naming all the rose varieties on display. 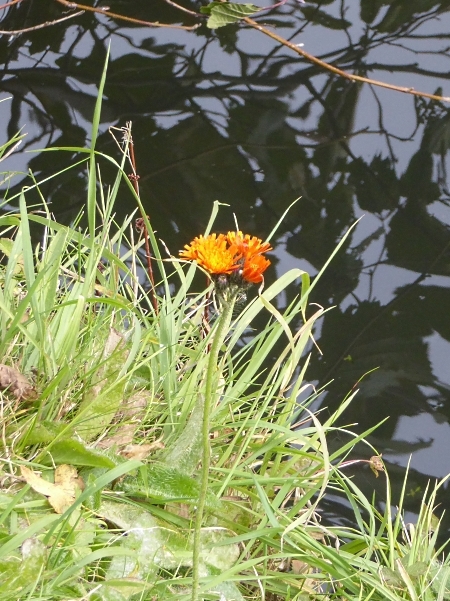 There were still a few of them in bloom, including this lovely single-flowered one. 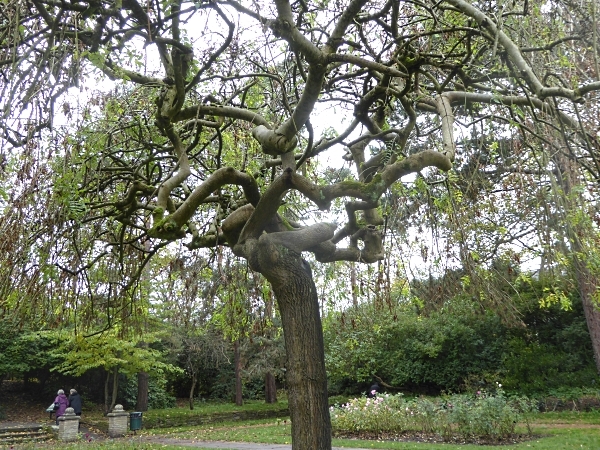 There are two Weeping Ashes placed symmetrically between the Rose beds, and because most of the foliage has dropped you can see the place where the drooping and contorted “weeping” branches were grafted to the straight trunk. 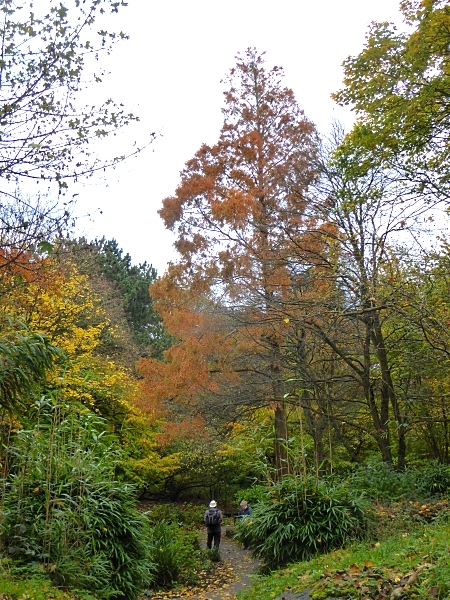 In the Specimen Garden is a tall Dawn Redwood Metasequoia glyptostroboides, with lovely rusty-red autumn foliage. 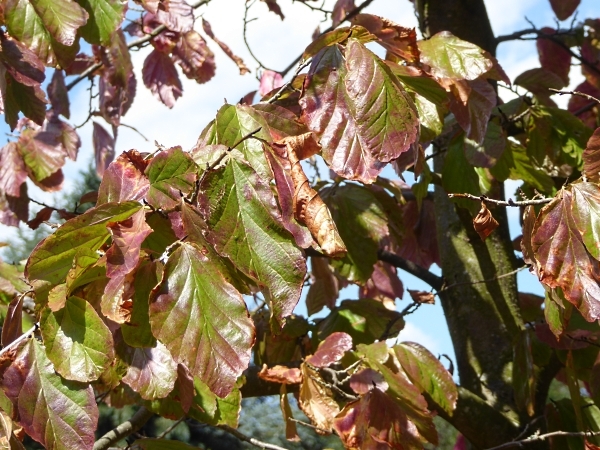 There were also two Persian Ironwoods, Parrotia persica, known for their autumn colour. The leaves still on the trees were green and yellow but the ones with the tinges of crimson had already fallen. 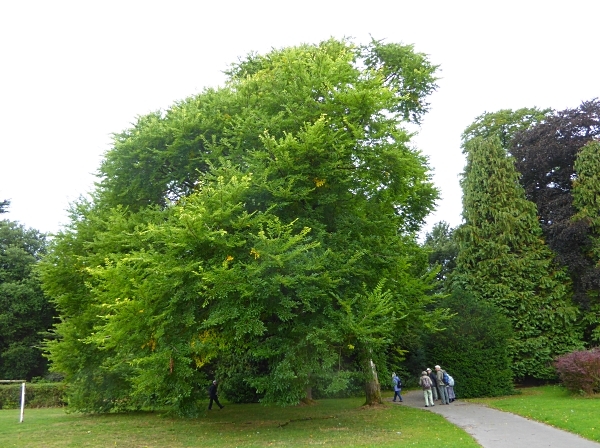 There are three Japanese Pagoda trees Styphnolobium japonicum in the park. There is a dead one at a path junction, a big labelled one near a gazebo, and very neat small one by the floral clock. We have never been to the area where the Stansfield Rock Garden used to be, but wandered that way this time. 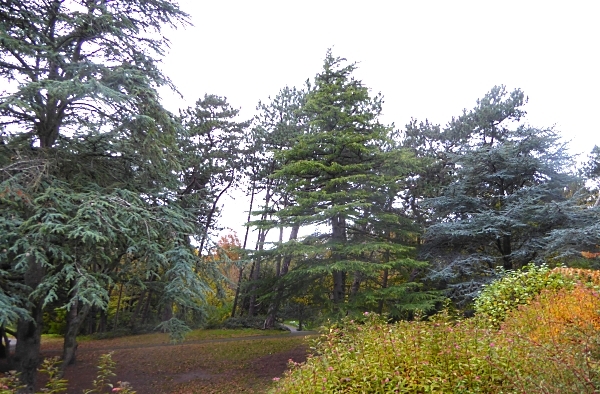 We chanced upon a row of three mature Cedars on the slope below the absent rockery. 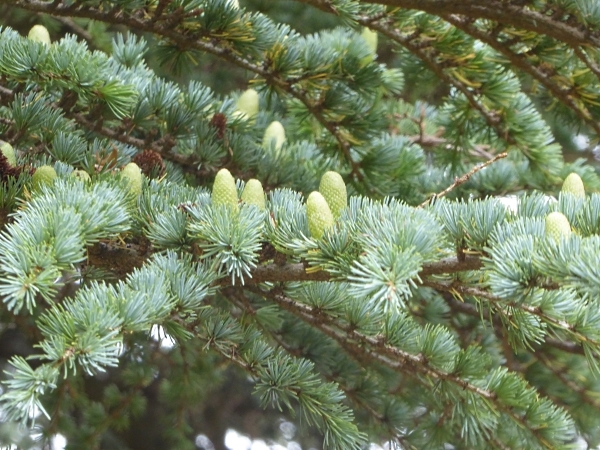 The one on the right was definitely a Blue Atlas Cedar Cedrus atlantica ‘Glauca’, the middle one with spring-green foliage and drooping branch-tips was definitely a Deodar Cedrus deodara but what was the other one on the left? 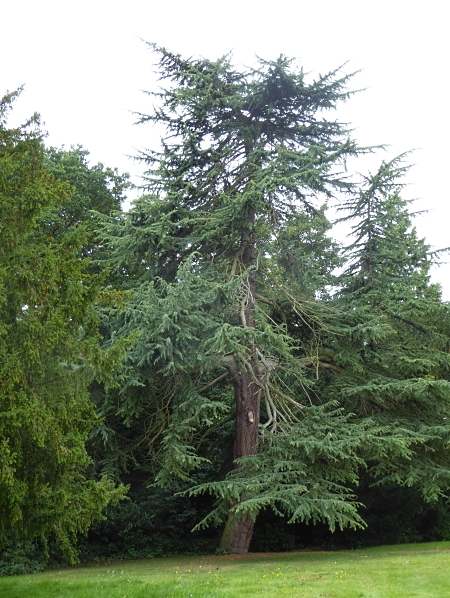 Could it be a Cedar of Lebanon Cedrus libani? If I had been planting three Cedars, that’s what I would have planted there! 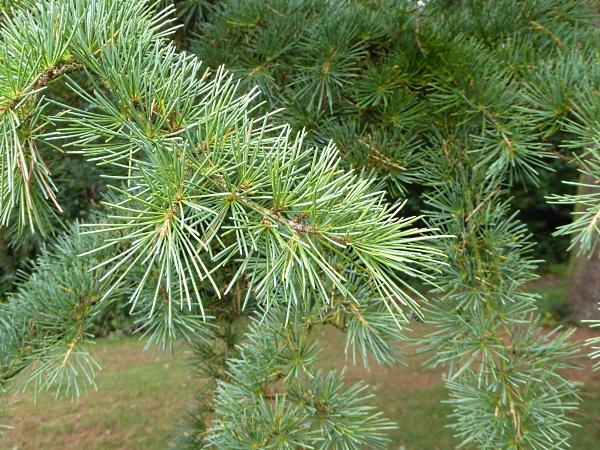 The foliage was right, with short even-sized needles, but counting against that ID was that it was slightly blueish green, and the branches weren’t noticeably level. It didn’t have multiple vertical trunks either. If it wasn’t a Lebanon it must have been the rarer green (not blue) Atlas Cedar, but my money is on a Cedar of Lebanon, just for the symmetry of the group. Drizzly rain started so we hopped it back to the bus. There are still a lot of leaves on the trees. 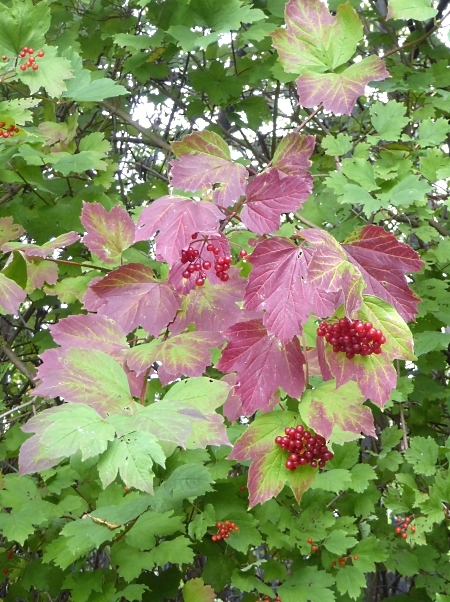 Limes and Norway Maples are yellow, Planes are still mostly green but the stars of this autumn’s show are the Cherry trees, bearing brilliant red-gold leaves. Strangely, we saw none like that inside the park, just the garden and street trees noted from the bus. Why? Is there a different micro-climate inside the park? 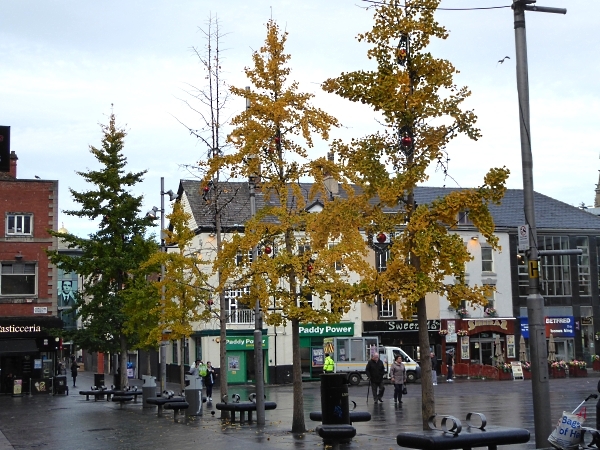 Before I met the others in the morning I photographed the five Ginkgoes in Williamson Square. 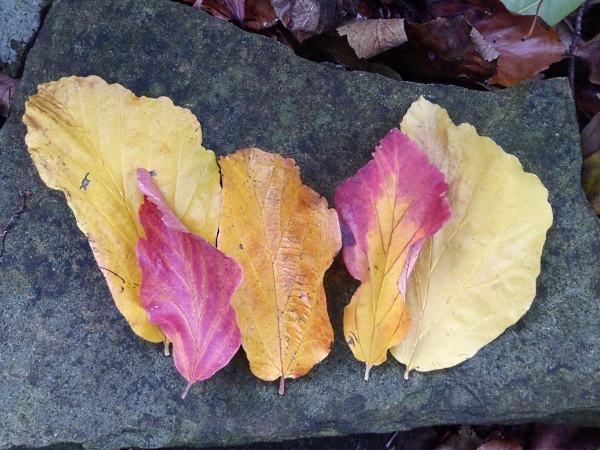 One is leafless, three have orange leaves and one is still green. They were all planted together, presumably from the same batch, but now they are showing great variation in height and foliage. Public transport details: 47 bus from Queen Square at 10.15, arriving next to the park at Albert Road / Park Road West at 10.28. Returned on the 47 at 1.50 from Albert Road / Park Road, due in Liverpool at about 3pm. When I did my recce a few days ago I spotted an uncommon tree that isn’t mentioned on the Conservation Management Plan’s tree map and list (how did they miss it?). Today we confirmed that tree and spotted another, also omitted from the plan. 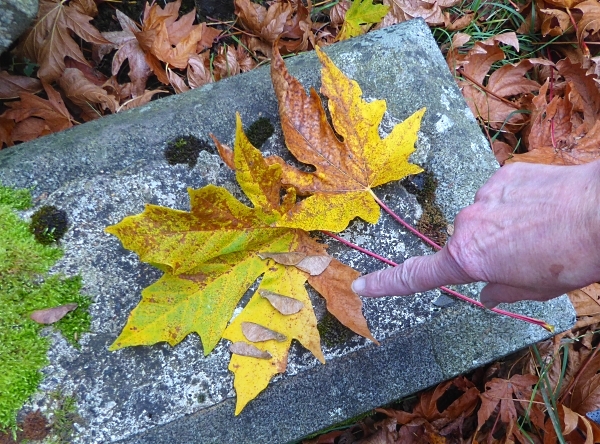 They are Oregon Maples (or Big-Leaf Maples) Acer macrophylla. Mitchell in his 1974 Field Guide called it “Infrequent” and said it was in just a few large gardens. Bob Hughes, in his 2005 tree map, noted one with a question mark, and we think he was right. One is in a clearing in section CE11, on the other side of the path from the Tulip Tree in section CE 16A. 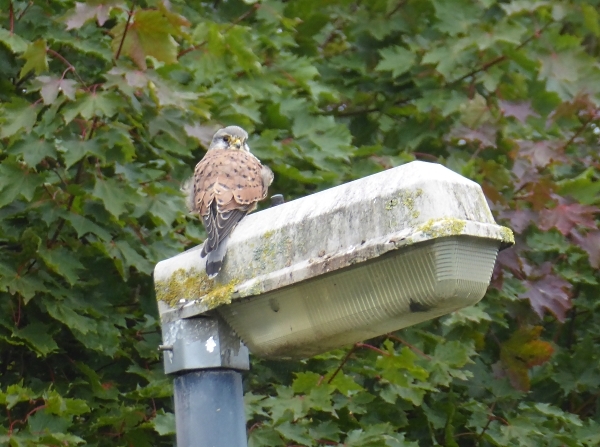 The other (the one Bob spotted) is in section CE 5A, on the corner of the ramp leading down to the Rowan walk. They are unmistakeable when you look at them, with very large classically-maple-shaped leaves, deeply indented, and with very long 20-30 cm leaf stalks. We also looked at the Rowans. On his 2005 map Bob Hughes listed the names of the ten different varieties that were supposed to be planted, but didn’t say which was which. 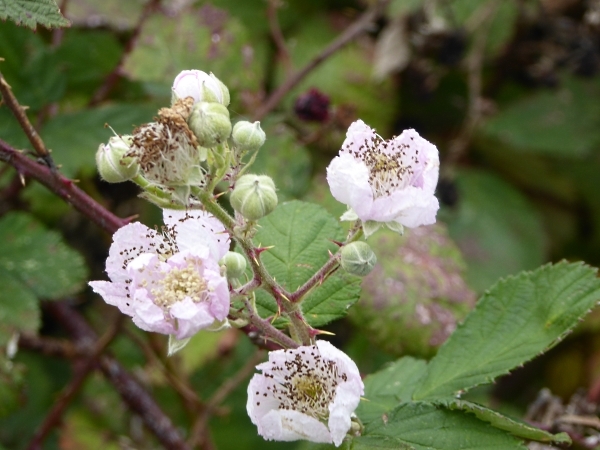 There are still ten trees there, five on each side of the path, but the only one that is identifiable with that early list is the cream-berried ‘Joseph Rock’. There should be two Whitebeams amongst them, and one with doubly-pinnate leaves, but none like that were in evidence. I suspect they couldn’t get the varieties on their wish list, or the trees they did plant were mis-labelled. But they are a fine double row of red-berried trees, and if it had been less drizzly we could have spent more time on them. Public transport details: Bus 437 from Sir Thomas Street at 10.04, arriving Upton Road / Boundary Road at 10.28. Returned from the opposite stop at 2.25, arriving Liverpool at 2.50. From Aughton Park station we turned right up Long Lane towards Aughton church. 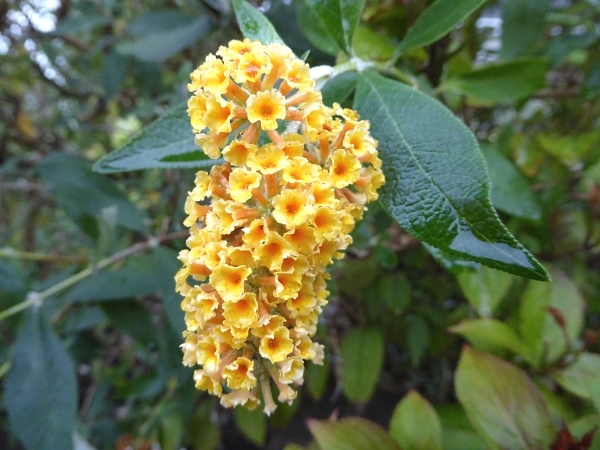 The gardens along here have some interesting plants including this yellow Buddleia, which was still flowering beautifully, although we saw no insects on it. 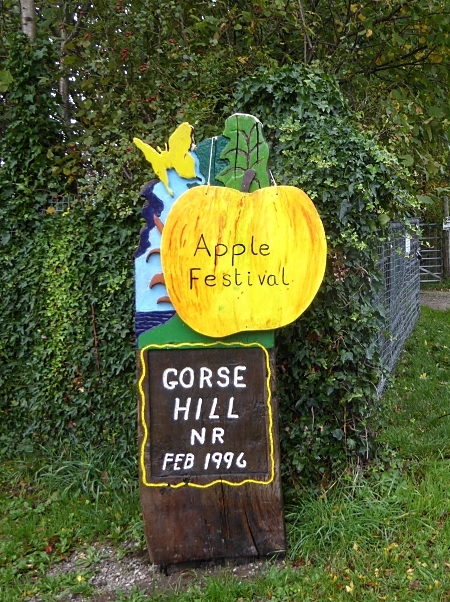 Then across Holborn Hill, the A59, up through the fields to the reservoir, then left to Gorse Hill reserve. Buttercup and Yarrow were still flowering by the wayside and there were Black-headed Gulls on the fresh ploughsoil, Starlings on Aughton church tower and many skeins of yapping Pink-footed Geese crossing the sky above. 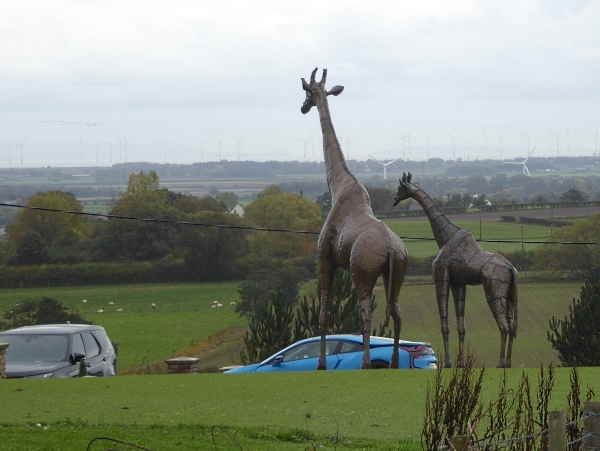 The house on Holly Lane that had one life-size Pangea metal sculpture of a giraffe in its garden now has two of them. They’re breeding! We took the orchard tour to see their 43 heritage varieties of apple trees. 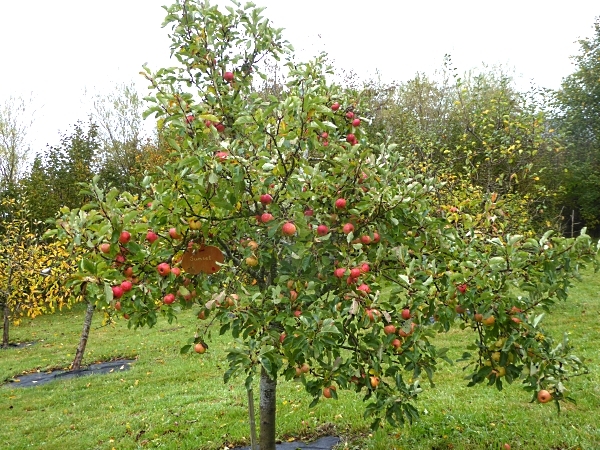 Most of the fruit has been harvested, but some is still on the tree, including the late variety “Sunset”. We walked through Cabin Wood, where they have old flagstones laid down as Newt shelters. Their “small mammal homes” are made from plastic tubes and hay, covered with carpet tiles then a pile of branches. 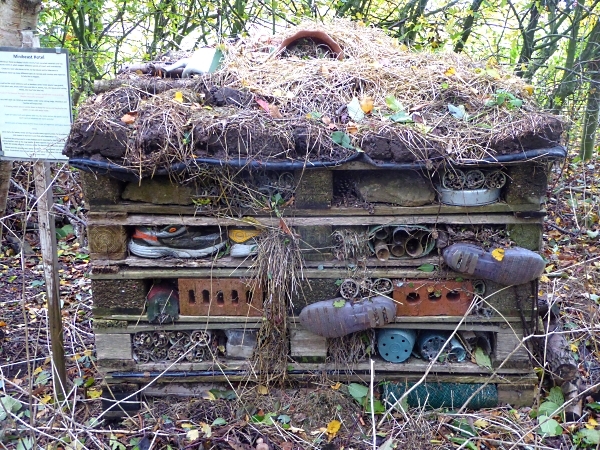 We were also charmed by this splendid bug hotel which, according to the sign, includes a pair of the reserve manager’s old trainers, wellies full of old socks and a discarded upturned kettle. After lunch overlooking Seldom’s Pond we sat in the bird hide for a while, but nothing came to the bird table with a tempting array of seed. 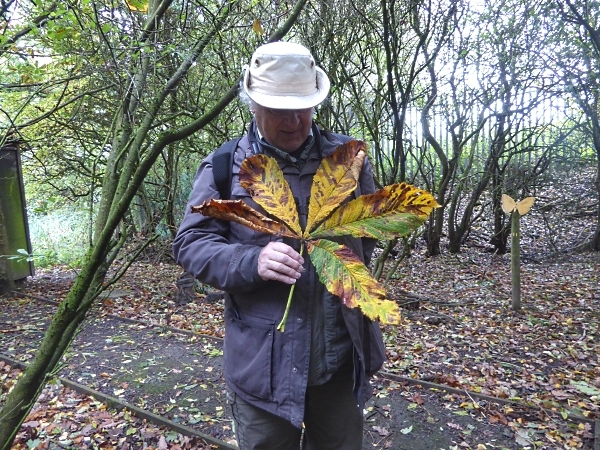 Outside we picked up this huge fallen Horse Chestnut leaf, the biggest we’ve ever seen. 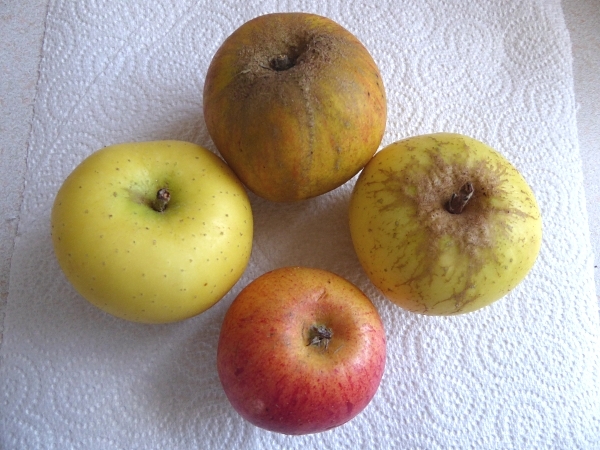 Back in the barns, the apple sale was ticking along successfully, and I got (clockwise from top) a Ribston Pippin, a Yorkshire Aromatic, a Sunset and a Galloway Pippin. 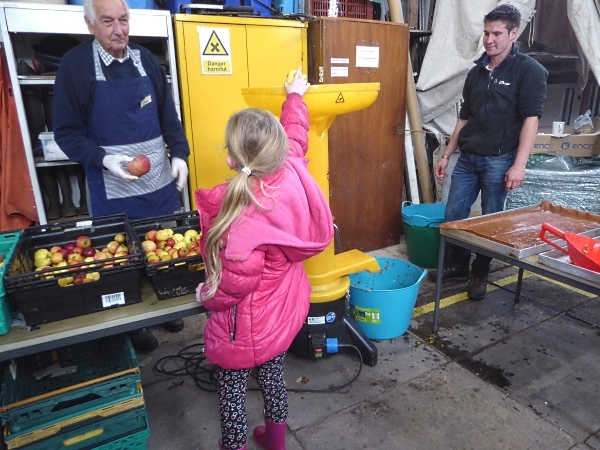 Then we watched the windfall apples being turned into fresh juice. (£2 for 500ml). 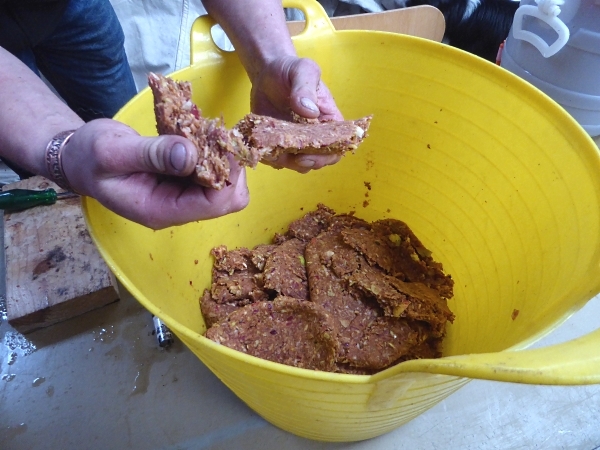 They are loaded into a hopper and chopped, then emerge sloppily into a blue bucket. 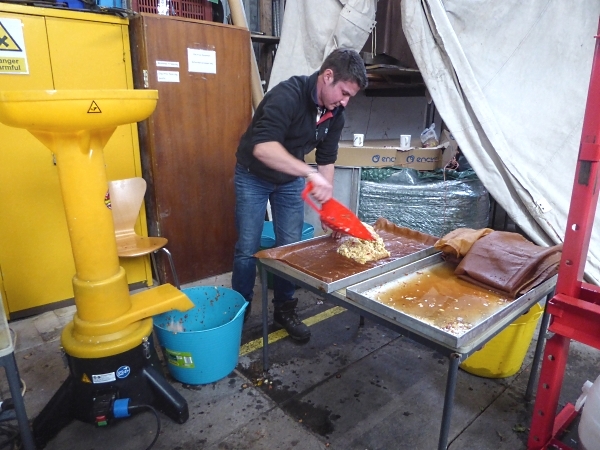 The pulp is then wrapped into sacking parcels and loaded into the press. 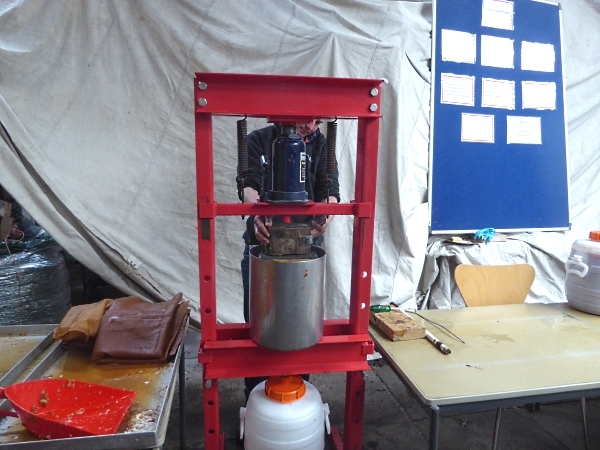 The juice is bottled by hand, and the remaining pressed cake is saved for animal feed. Horses are very fond of it, apparently. Then we walked out onto the open ridge. 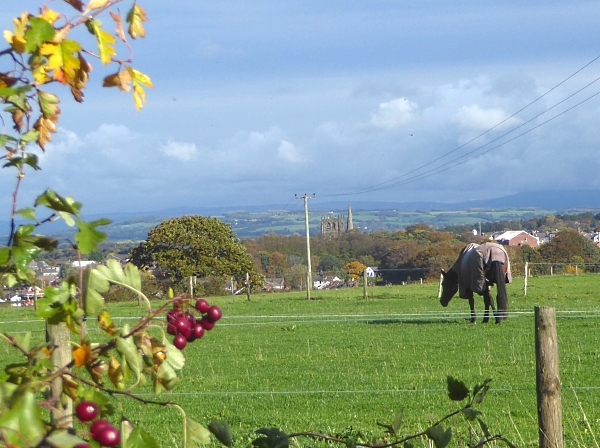 Gorse Hill is a mere 81 meters above sea level, but on the flat Lancashire Plain that makes for very long views. Through a gap in the hedge we could see Blackpool Tower on the right and the hair-raising funfair ride called The Big One on the left. A Jay flew by and a Robin perched on a gate. We wandered about a bit, looking for a Yellowhammer, but no luck today. We returned around the back of the reservoir and emerged to the lovely view over Ormskirk church, with its rare “double” of a tower and a steeple. Public transport details: The Ormskirk train from Central at 10.17, arriving Aughton Park at 10.45. Returned from Aughton Park Station on the 15.40 train, due in Liverpool at 16.10. 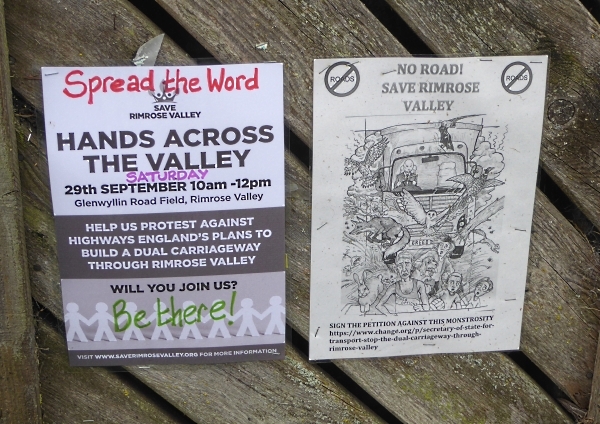 Where we are meeting: Meet 10.30 at Bromborough Rake station. Do I need to book? No, just turn up. Since it was Heritage Open Day, the Flaybrick Chapels were open to the public from 2pm, but we had the morning to mooch around the gardens. 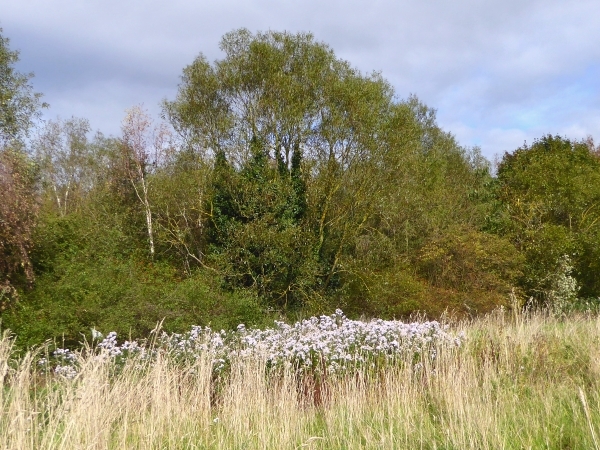 I have been studying the tree survey in the Conservation Management Plan (CMP) (see the link to it in the report of our previous visit on 8th July) and cross-checking it against two previous tree lists. There were some discrepancies I wanted to check. From the bus stop we strolled through King George’s Way woods and Tam O’Shanter’s car park. Rain had been forecast, but we got a dull and cloudy day instead. 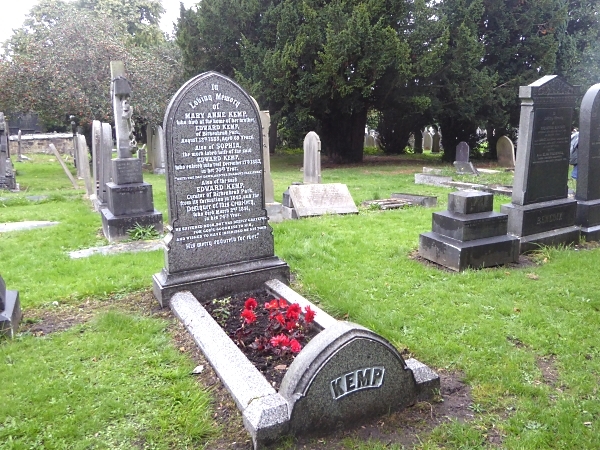 Our first stop was the grave of Edward Kemp. 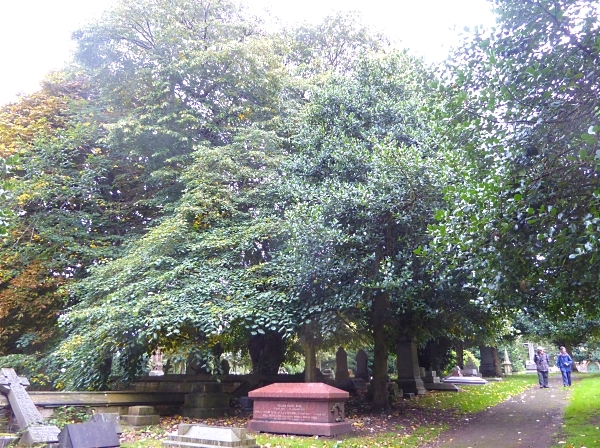 He laid out Flaybrick Cemetery and many local parks, including many of our favourite Sunday Walk destinations. We have to regard him as our patron saint! The tree plan in the CMP incorrectly identified several Deodar Cedars as Cedars of Lebanon, which we looked at, just to be sure. Yes, they are definitely Deodars. 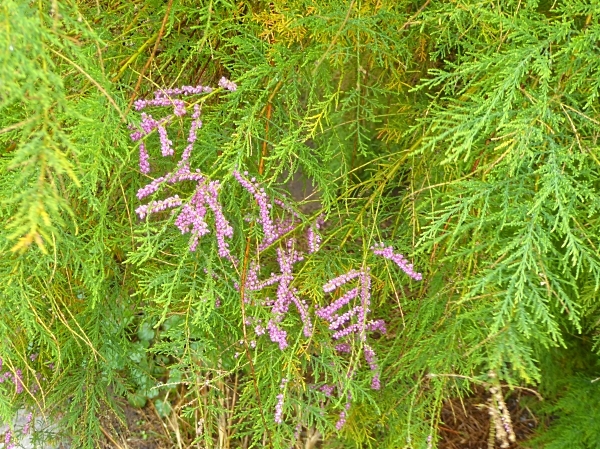 It also noted a Sawara Cypress in “shrubbery G44”, but that wasn’t marked on the map so we had to guess where it was. We rummaged in a likely place, but no obvious Cypresses. 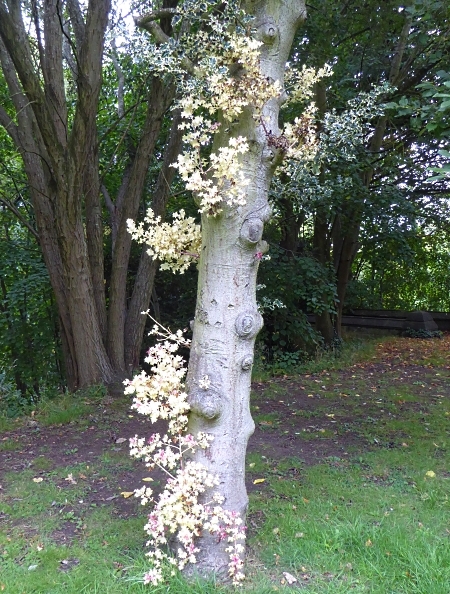 We had better luck with the tree said to be a “Weeping Large-Leaved Lime”. It’s a fine tree, but not obviously “weeping”. None of my tree books mention a weeping variety, either. I’m still not sure about Large-leaved Limes. The books say that the fruits are “8-10mm” and “five-ribbed”, but I’ve never seen fruits like that. 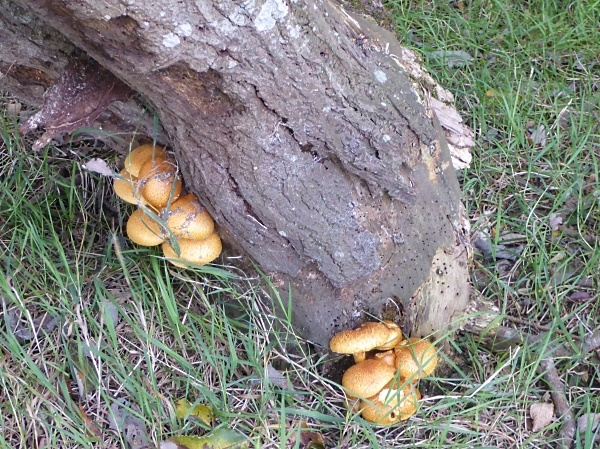 They all seem smaller and rounder, like the ones on this tree. 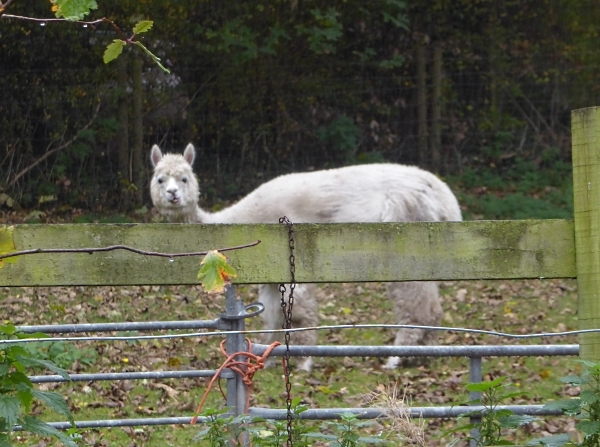 Is it possible that we have a local variant in Merseyside, or is it hybridisation? They are very hard to definitely identify, anyway. 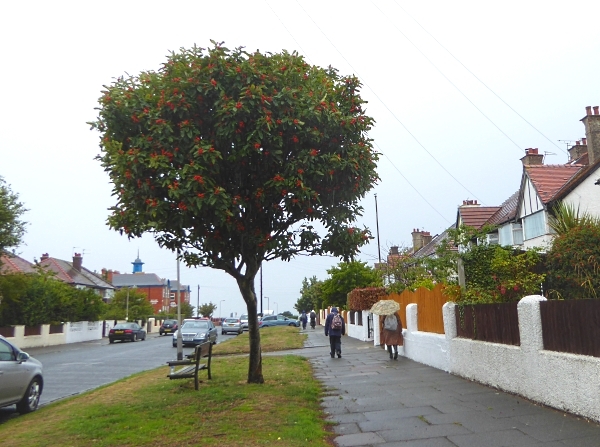 The CMP suggested that lots of the overgrown Hollies should be pruned, to let in more light. 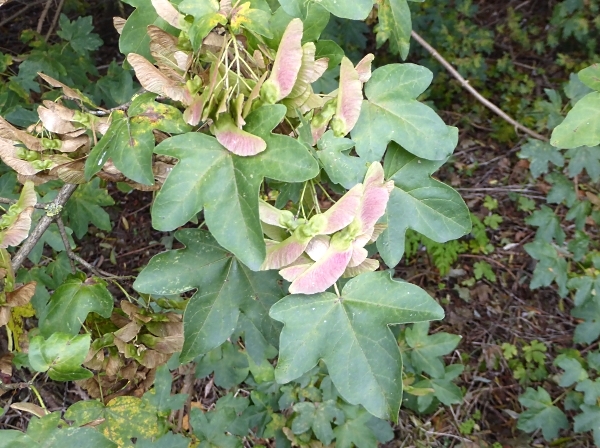 The volunteers have been heeding that advice, and we noted many severely-lopped Holly trunks, all sprouting exuberant new pink and white growth. 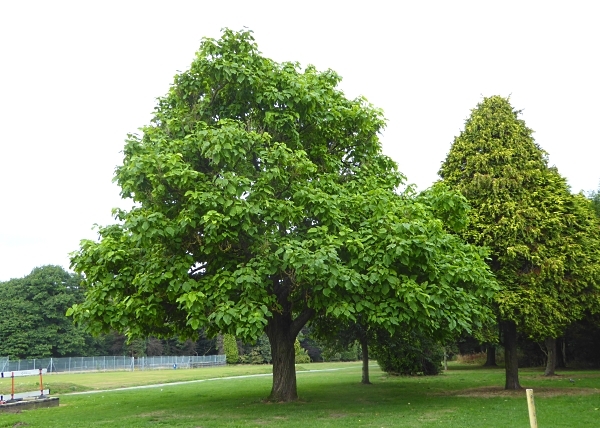 Two trees previously noted as Large-leaved Limes have recently been re-identified as American Limes or American Basswoods, Tilia americana. One is the National Champion for girth, and according to the Friends of Flaybrick Facebook page, was fitted with an official “Champion” nameplate several weeks ago. We went to see it, and hunted high and low on the trunk and through the low sprouts, but we couldn’t find it. Later a volunteer at the chapels told us that the label had been pinched, but another is on the way! Our last tree before lunch was a huge Horse Chestnut, possibly an original Kemp planting, which has the disease “bleeding canker” and might drop large branches, making it a danger to passers-by. 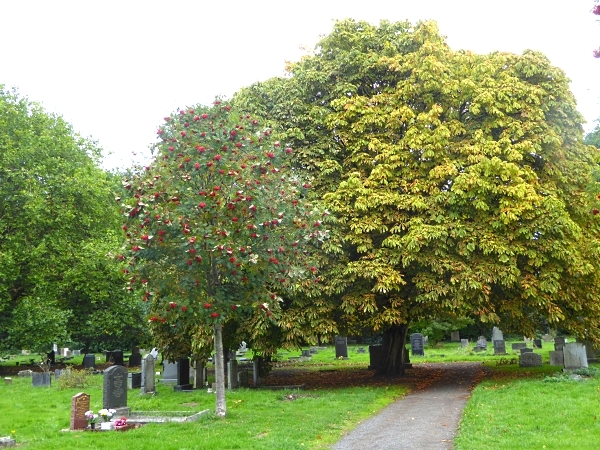 It is to be felled, which is sad, because it’s still a fine-looking tree. We lunched on the picnic tables in Tam O’Shanter and then found a cluster of interesting trees we hadn’t noted before. At the back corner of Tam’s cottage, opposite the loos, some connoisseur has planted a Mulberry, a Gingko and a Contorted Hazel in the garden! 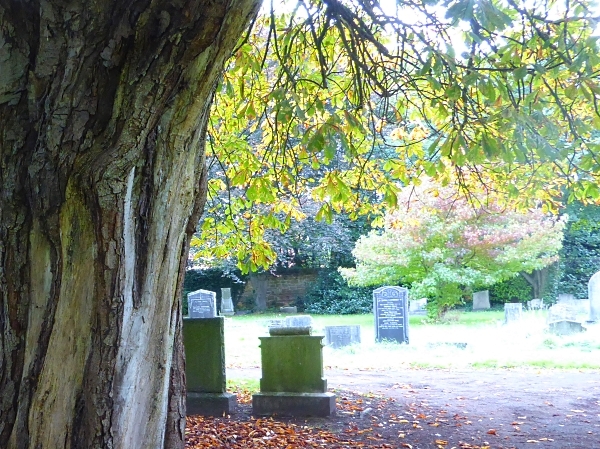 Since we still had some time before the chapels opened we went back into Flaybrick to pay our respects to the Exeter Elm, which has died in this summer’s drought. It had several claims to fame. 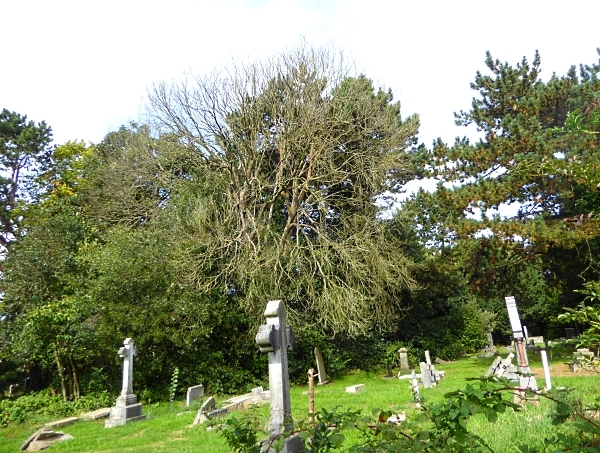 It was a rare Elm variety which had survived Dutch Elm disease so was a tree of national significance, it was thought to be an original Kemp planting, and it was host to a colony of White-letter hairstreak butterflies until about 10 years ago. But now it’s bare, grey and dead. But a dead tree is always an opportunity for something else. It has been claimed by a Great Spotted Woodpecker, which sat on the highest dead twig and watched us closely to make sure we were leaving! 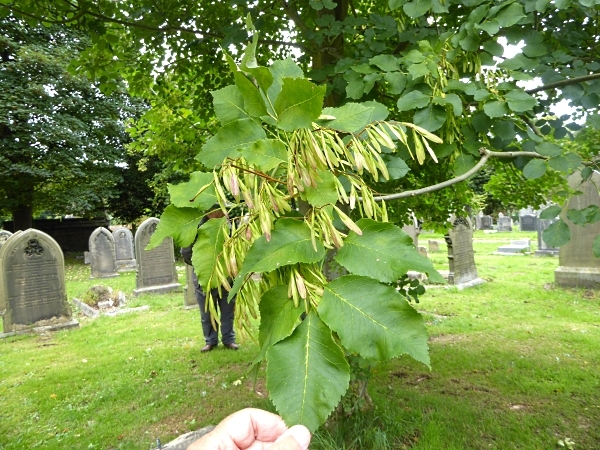 Then we were distracted by a young Ash tree which looked a bit odd. 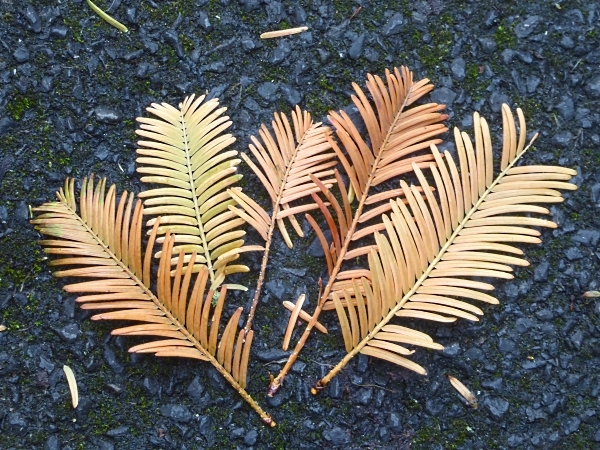 The “keys” were a bit sparse, slim and pale, and there were only five leaflets on the leaves. It might have been just because it was a young tree, but I later found that the survey map identifies it as a Manna Ash. That’s quite gratifying, that we spotted something different about the Ash, even though we couldn’t say exactly what it was. 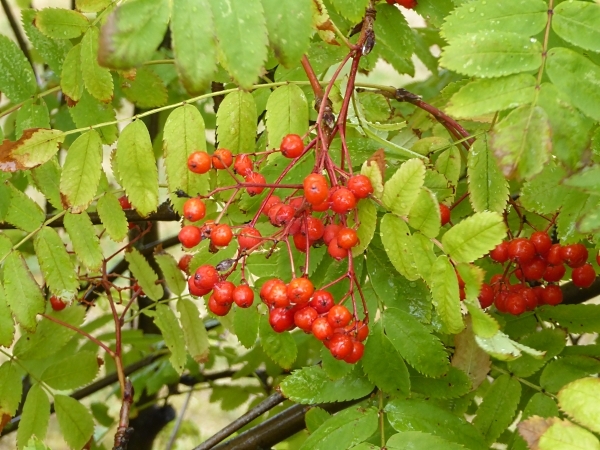 Our last rare tree was the Orange-berried Service Tree, which had me puzzling over my ID guides a couple of years ago. 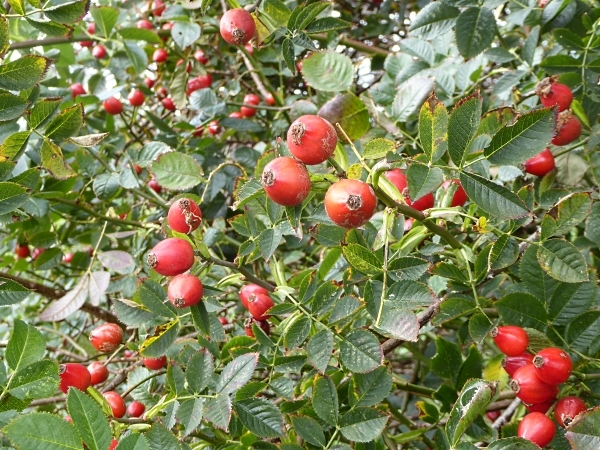 Now it has a tree label fixed to the trunk, saying it is Sorbus croceocarpa, a tree so rare it isn’t in any of my books. 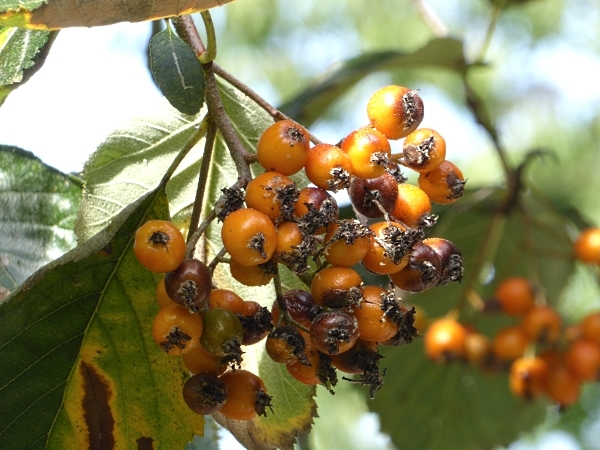 It is sometimes called the Orange Whitebeam and is thought to have been introduced from Southern Europe. Most of the British ones are in the North West of England, so I wonder if Kemp was responsible? 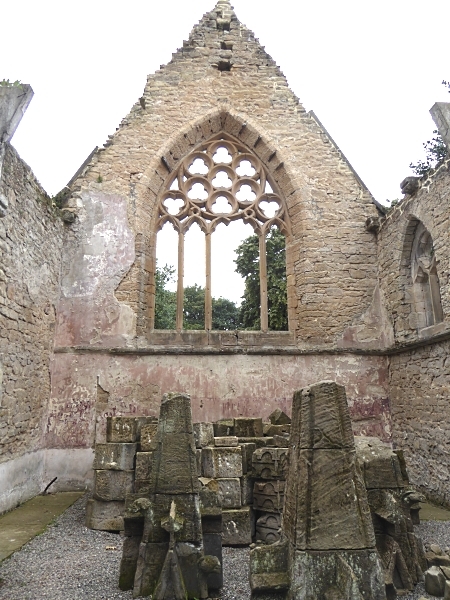 Then we had a look around the ruined chapels. The Friends had a display area, giving out their new leaflet and hoping for new members. Public transport details: Bus 437 from Sir Thomas Street at 10.04, arriving Upton Road / Boundary Road at 10.28. Returned on the 437 bus from the opposite bus stop at Upton Road / Boundary Road at 3.17, arriving Liverpool 3.35. 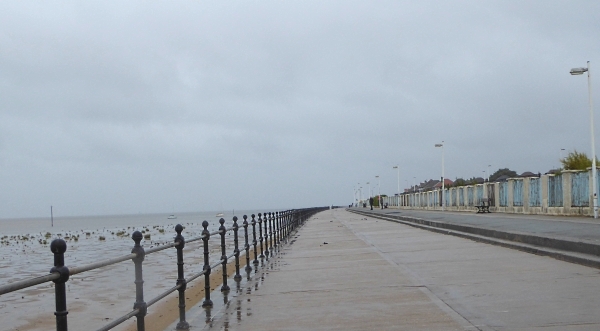 It was a wet, drizzly day as we trudged down Manor Road and Hoyle Road to the Lifeboat Station on North Parade, then along to the seafront shelter. 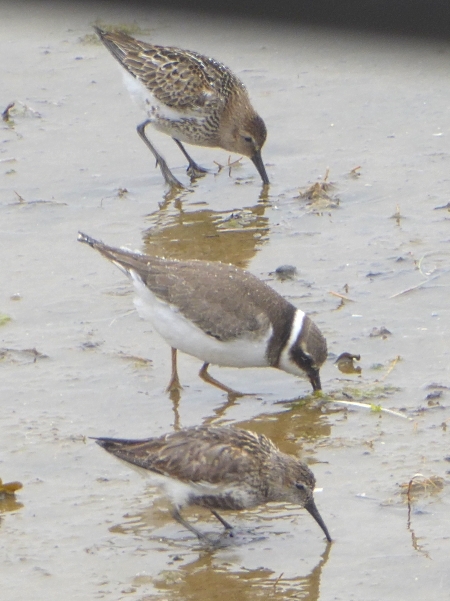 There was a high tide due just after noon, which brings lots of waders close inshore. One advantage of the terrible weather was that there were no holidaymakers or noisy kids. We had it all to ourselves, apart from a couple of hard-core bird watchers with telescopes. We settled into the shelter and just stayed there, watching the birds. To our initial dismay, a man with three dogs on leads walked out past the gulls, but he disturbed them only a little, merely making them walk aside nervously. When he was further out he let the dogs loose and they ran about and had fun, apparently not bothering any birds. 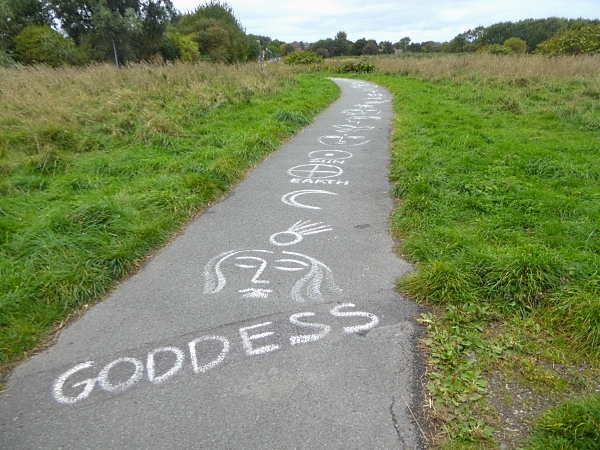 Then the leads were re-attached and they all walked back. Although we were worried at first, it seems that the messages about not disturbing the birds are getting through to the locals. Well done that man! The birder with the top-notch telescope called out Grey Plovers on the distant tide line and later he reported Bar-tailed Godwits and a Whimbrel very far out, beyond our binocular range, but we were more interested in the little birds closer in. 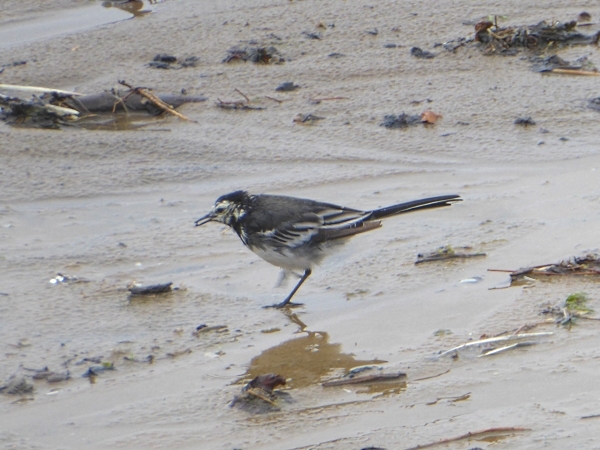 There were a surprising number of Pied Wagtails, all looking rather scruffy, and I suppose they were moulting. 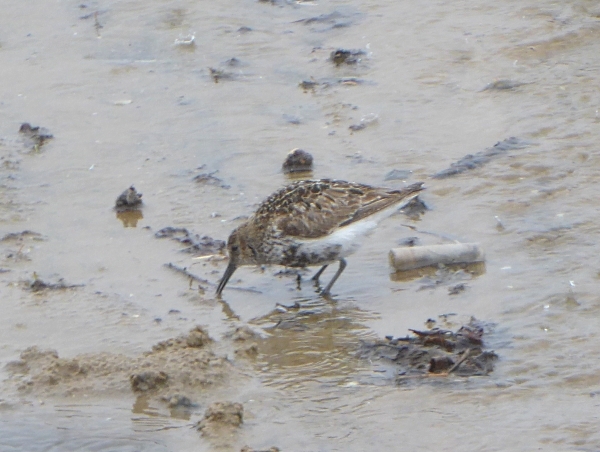 Dunlin were scurrying about, many with their summer-plumage black bellies. 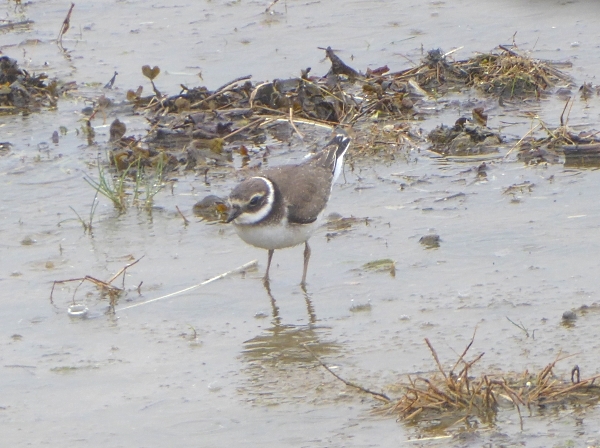 There were huge numbers of Ringed Plover, most with black beaks and pristine plumage, identifying them as this year’s young. They were feeding in the shallow mud by foot-waggling, like Egrets do, to disturb the sand and reveal things to eat. We ate our lunch there, revelling in the wonderful views of these little birds, all just by the sea wall, and nearer than we have ever seen them. They didn’t appear to be a bit bothered that we were there in the shelter so long as we didn’t get up and walk about. They seemed to like that particular spot, bickering occasionally over the right puddle, perhaps because a little stream of clean rainwater came out onto the beach there. The tide didn’t come right in, so the gulls congregated further out – Lesser and Greater Black-backs, Herring Gulls and Black-headed Gulls. Out by the rocks off the Lifeboat Station was a long line of Oystercatchers. 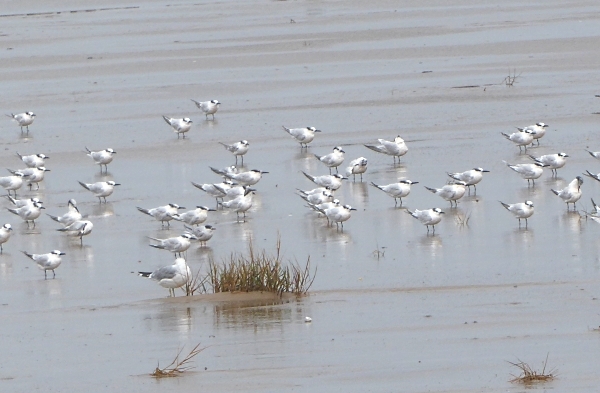 There was group of over 100 Terns, nearly all Sandwich Terns with black beaks. Amongst them were two or three Common Terns, which I can now pick out on my photo, with shorter legs, blacker heads and red beaks. There’s one on the left of the tuft of Spartina grass, two birds back from the gull. We’d been sitting too long, and getting cold. Two of us had put their gloves on! We took a turn around Parade Gardens, noting the Tamarisk hedge. Some of it was just starting to flower. I thought it was an early spring bloomer, but the books say late summer into autumn, so it was just getting going. Then we headed back to the station up Deneshey Road. 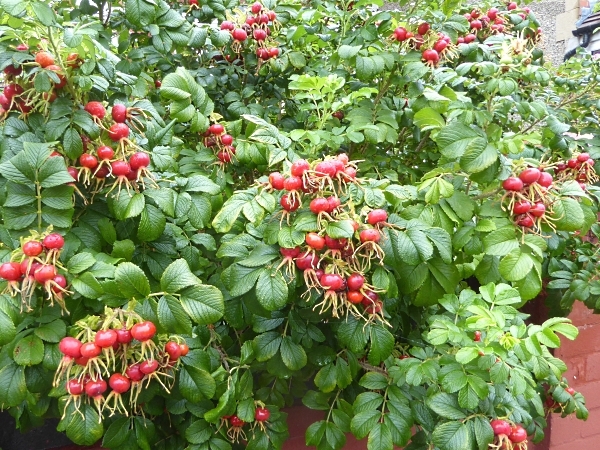 In this more sheltered spot there were interesting things in the gardens, including a False Acacia tree (Robinia), a Rowan with lots of red berries, a purple Hibiscus and lots of fruits of the Japanese Rose Rosa rugosa. Public transport details: West Kirby train from Central at 10.05, arriving Manor Road at 10.30. Returned from Manor Road Station at 13.38, arriving Central at 2.10. 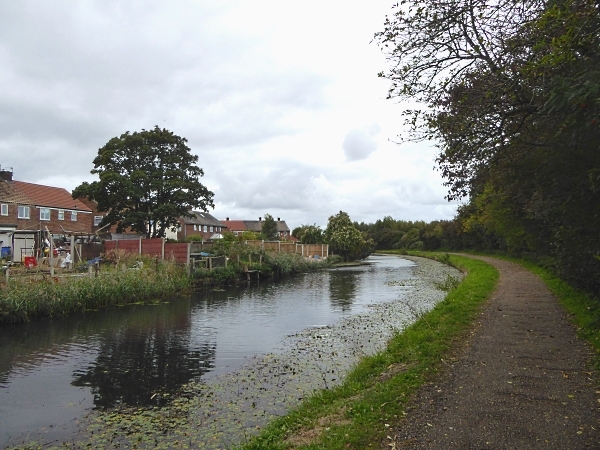 Arrowe Park was once a farm owned by a wealthy Liverpool ship-owner and slave trader called John Shaw. His nephew John Ralph Nicholson Shaw inherited the land in 1829 and set about building Arrowe Hall and a country estate. Arrowe Hall (now a Grade II listed mansion) and its park were acquired by Lord Leverhulme in 1908, who subsequently sold the estate to Birkenhead Corporation in 1926. 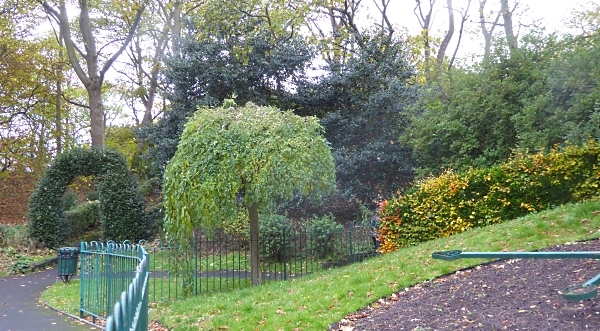 On 1 April 1974, ownership was transferred from Birkenhead Corporation to the Metropolitan Borough of Wirral and is now a public park. The Hall is now a private care centre. We went in by the main entrance and lodge and headed southwards. 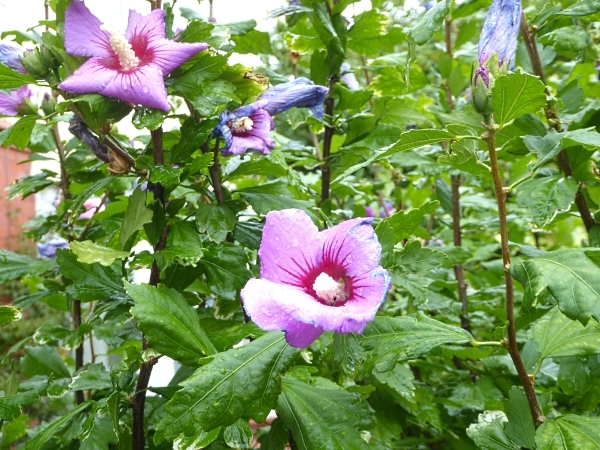 It was damp, overcast and blowy, but happily the promised rain never came. 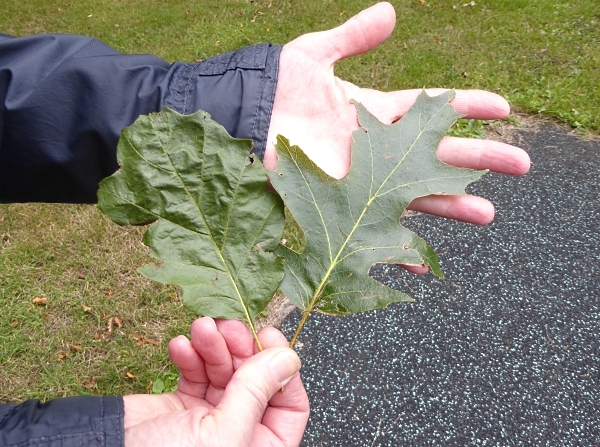 As the woods opened out towards the tennis courts we found two less-common oaks next to each other, a Red Oak Quercus rubra (left leaf below) and a Pin Oak Quercus palustris (right leaf below). 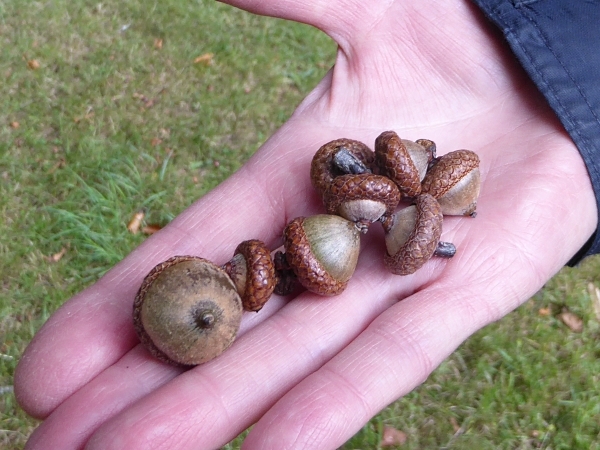 Underneath them were these lovely acorns, which I think belonged to the Pin Oak. The old clay tennis courts are now neglected, and overgrown with Ragwort and Yarrow, but a few of the grass courts are still in use. Between the clay and grass courts was a line of molehills, and at the end a pair of interesting trees. 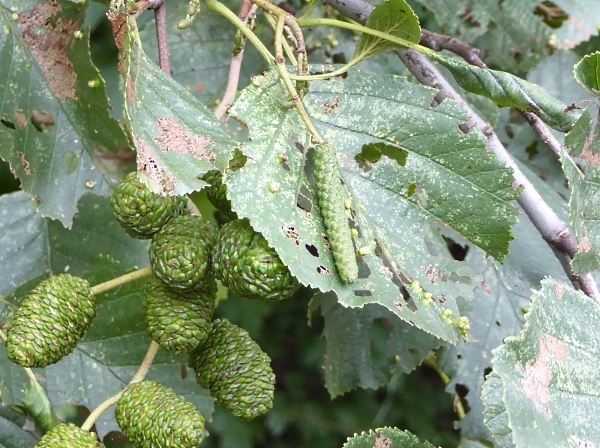 I think they are some kind of uncommon Elm. 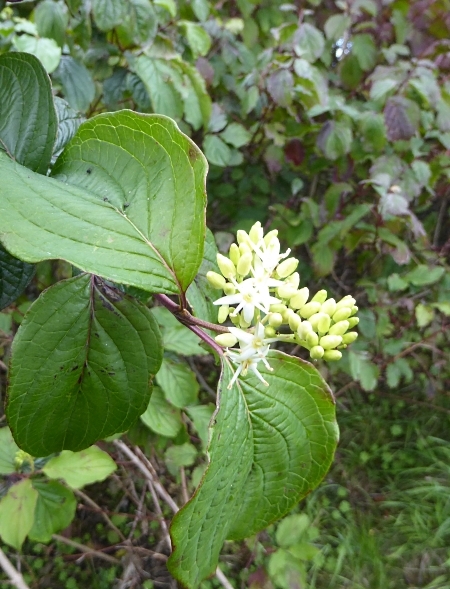 The leaves appeared to be long compound leaves like Ash, but there were dark brown buds in every axil, so all the “leaflets” were separate leaves, arranged alternately. 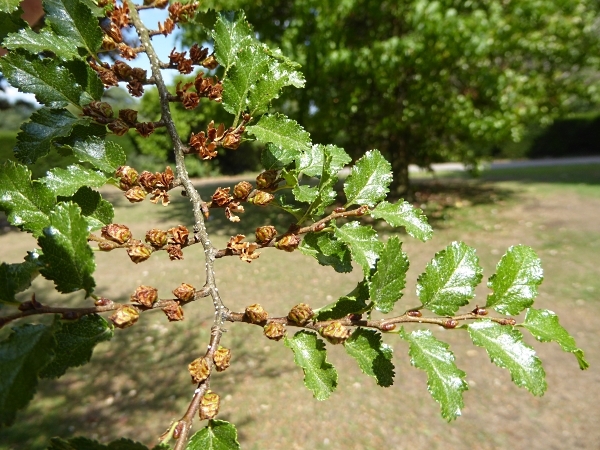 The leaves themselves were shiny dark green with serrated edges and twisted irregular bases, which is a characteristic of Elm leaves. 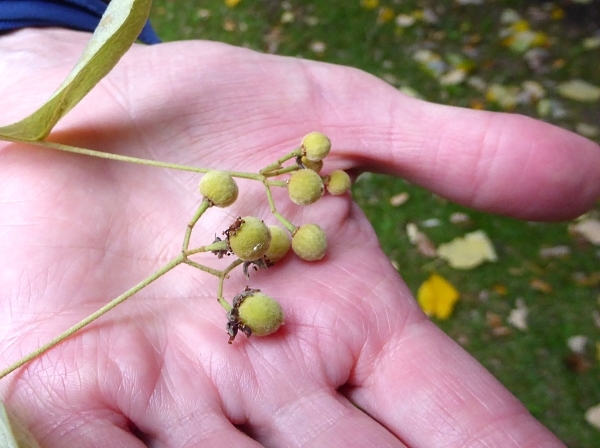 They weren’t rough like Wych Elm and there were no seeds underneath to give us a clue. 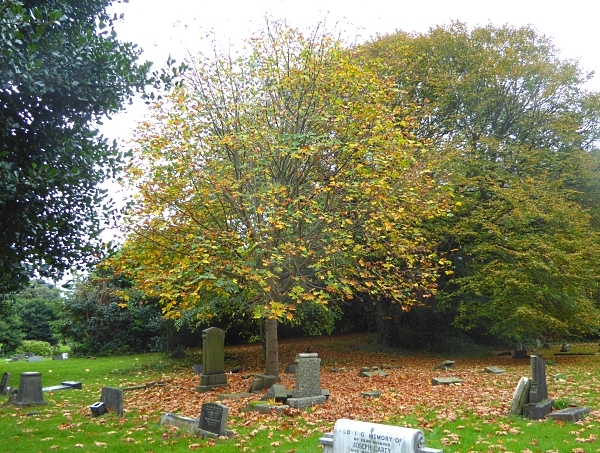 They were mature trees, not young ones planted since the English Elms all died in the 1980s. 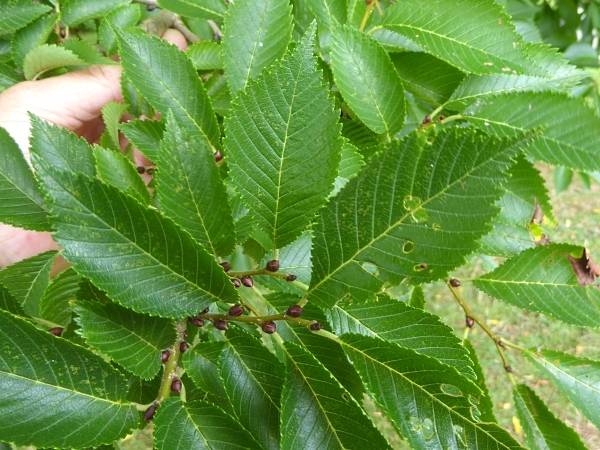 It’s hard to identify unfamiliar trees on first sight but my favourite candidate is Smooth-leaved Elm Ulmus carpinifolia, but I can’t rule out Siberian or Chinese Elms. As we crossed the open field towards the Arrowe Brook two Mute Swans flew over, followed by about 20 Canada Geese. 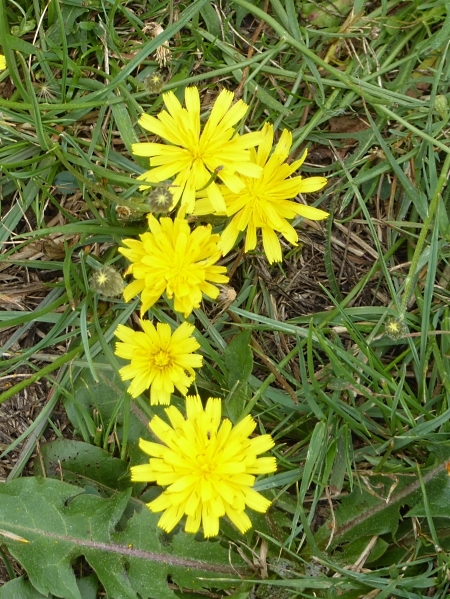 The field was streaked with carpets of bright yellow flowers, giving a buttercups-in-spring effect, but they were one of the dandelion-ish flowers, perhaps Common Hawkweed. 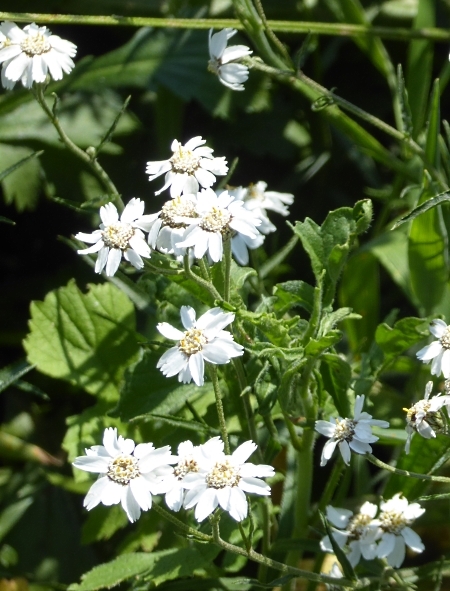 Maybe they have all flowered together, refreshed by last week’s rain after the drought. The brook and lake had Canada Geese, moulting Mallards and one young Moorhen. We hoped for Mandarins but there was no sign of any, and we are always alert to the possibility of a Kingfisher along the Arrowe Brook too, but there were too many people about. 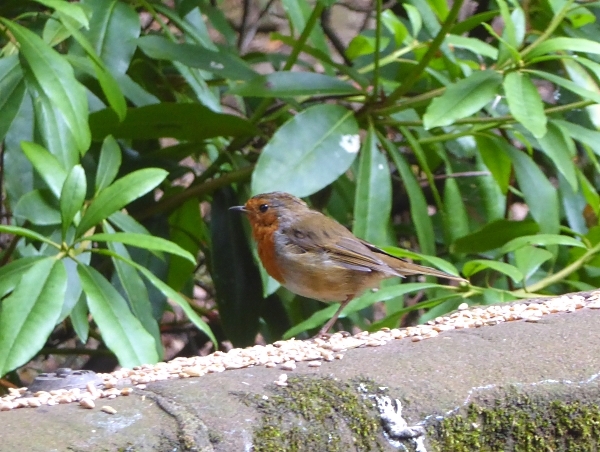 There was a Robin on the bridge where the birdseed is always scattered. Is that a one-legged Robin? Back in the woods we heard some noisy screeching and wondered if Ring-necked Parakeets had colonised the park, but it was coming from a pair of Jays having an argument over something. 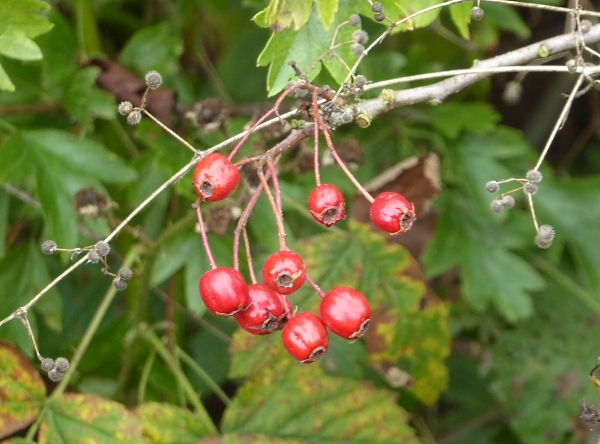 Blackberries are ripening everywhere and we saw our first red Hawthorn berries. We were on the look-out for the Cedar of Lebanon said to be near Arrowe Hall. 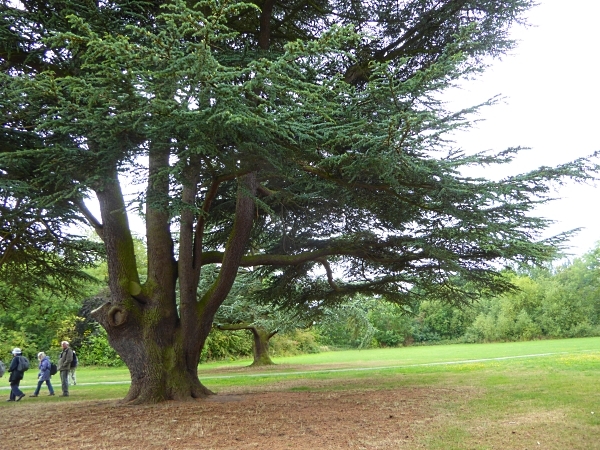 One promising-looking level-branched tree on the far side of the lawn turned out to be a Deodar Cedar, identified by its long and uneven needles. 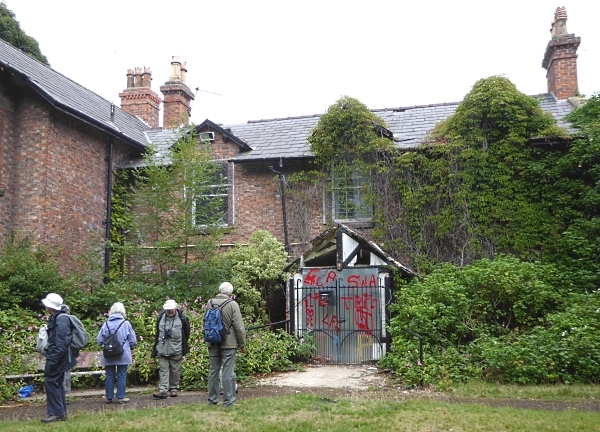 We returned via the derelict Ranger’s Office, now overgrown with Ivy and Buddleia, vandalised and starting to fall apart. 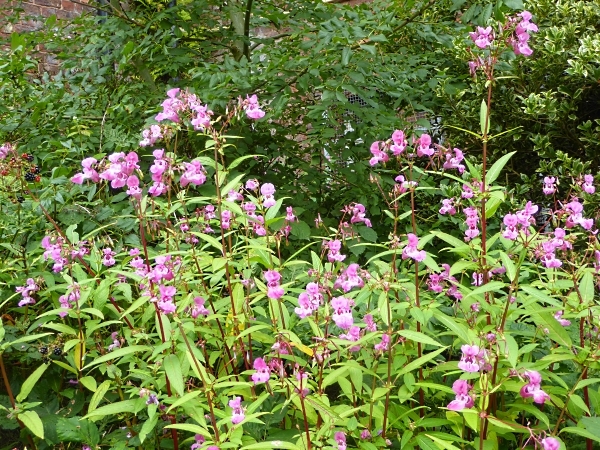 Its garden is being swamped by Bramble and Himalayan Balsam. 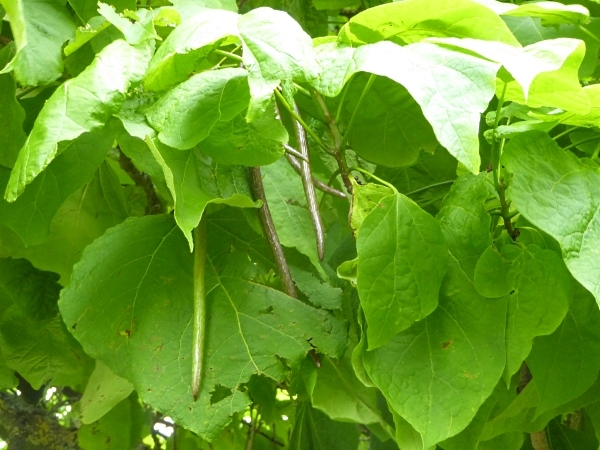 Towards the main gate we spotted a young Indian Bean tree, with a few hanging bean pods. 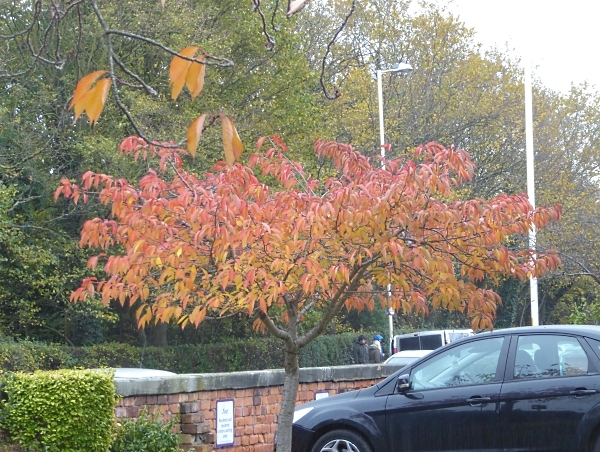 So Wirral have been planting some trees since they took over the estate. Public transport details: Bus 472 from Sir Thomas Street at 10.13, arriving Woodchurch Road / Arrowe Park Road at 10.40. Returned on the 472 bus from Woodchurch Road / Church Lane at 2.13, arriving Liverpool at 2.36. 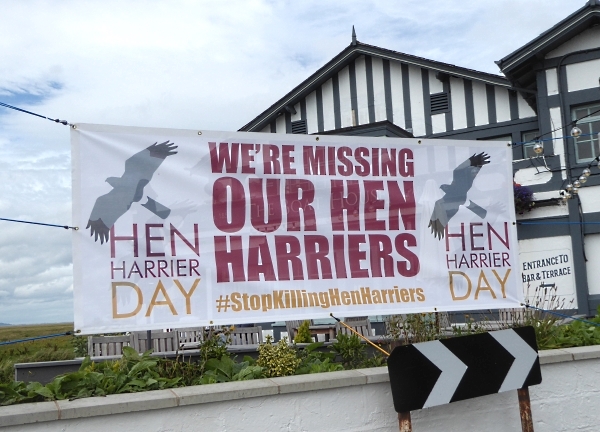 Sunday was a national day of protest to mark the opening of the grouse-shooting season and the associated illegal killings of Hen Harriers. 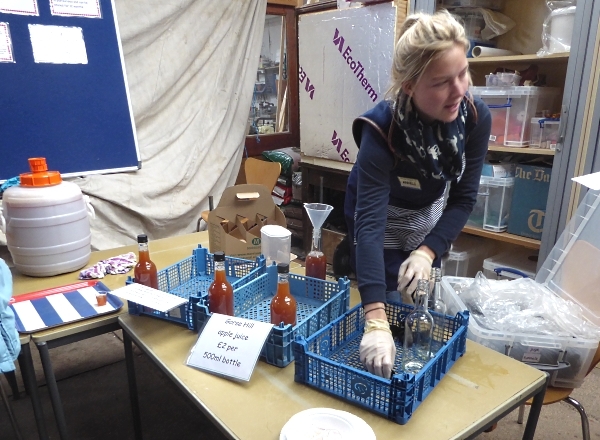 Our nearest event was at Parkgate. The tide was out, but the marsh was surprisingly green despite the recent drought. We spotted Swallows chirping overhead, a pair of Herons, and there was a report of over a dozen Greenshank, but we weren’t looking that hard. 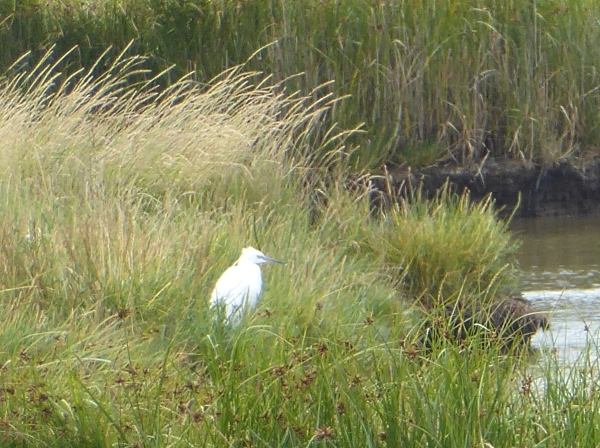 We did see this Little Egret, though. We had an early lunch in the garden of St Thomas’s church, then set off to the Old Baths area for the event. 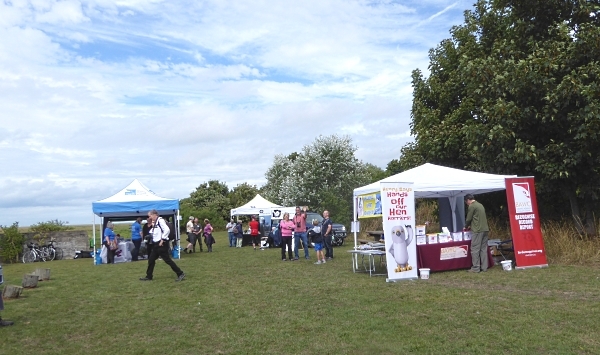 The RSPB, Cheshire Wildlife Trust and Birders Against Wildlife Crime (BAWC) had small tents set up and there were about 200 people, including several MNA members, milling about, buying raffle tickets and waiting for the speakers. 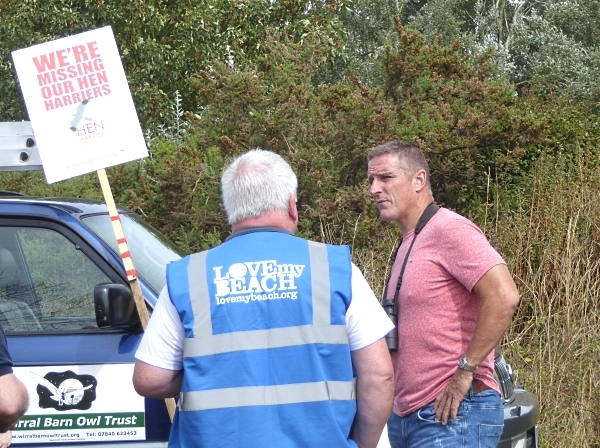 They included Iolo Williams, Mark Avery (blogger and former RSPB conservation director), Jeff Clarke, someone from Burton Mere reserve, whose name I didn’t catch, and several others. Mark Avery’s blog has a photo, and claims attendance of 300, making it one of the best-attended events in the country. There were also a couple of non-wildlife distractions today. 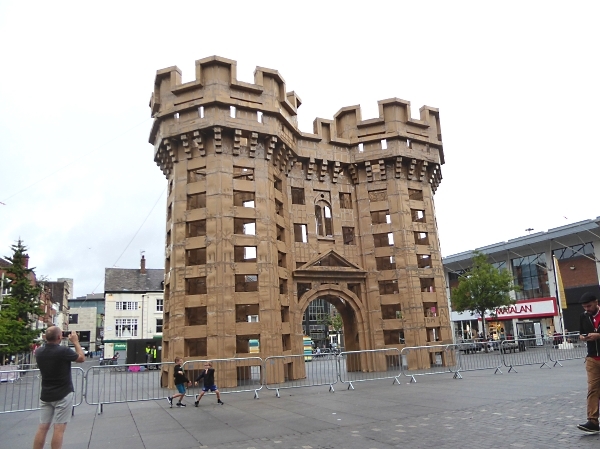 One was the Lost Castles Project – six cardboard-box castles dotted around Merseyside, designed by the French artist Olivier Grossetête. I spotted the one in Bootle North Park on my way in, and here’s the one in Williamson Square. 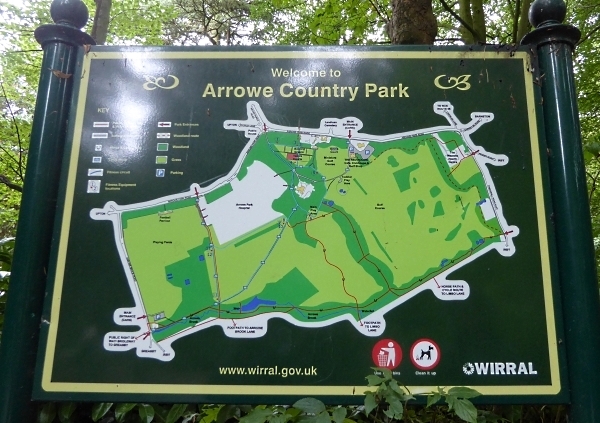 Apparently two others had already collapsed after being weakened by the rain – the ones in Ashton Park West Kirby and in Knowsley Safari Park. By the end of the day, this one in town had also collapsed. 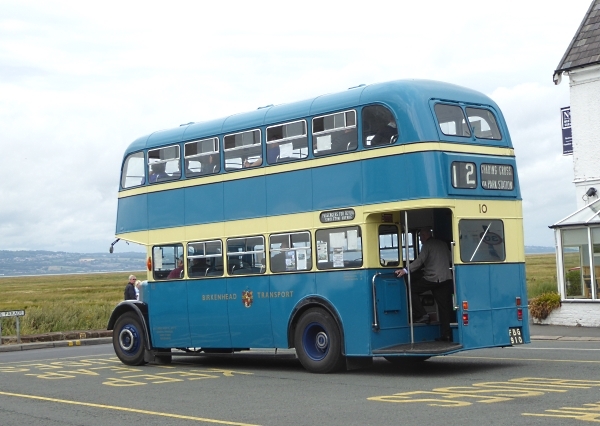 Some chartered vintage buses were coming in and out of Parkgate Mostyn Square, an orange and green Crosville and this lovely old Wirral blue-and-cream double-decker, which is the livery I remember from my childhood days out. Public transport details: Bus 487 from Sir Thomas Street at 10.29, arriving at Parkgate Mostyn Square at 11.25. Most of us returned on the 487 at 1.30, but the keenest ones looked set to stay until the 3.30 bus. 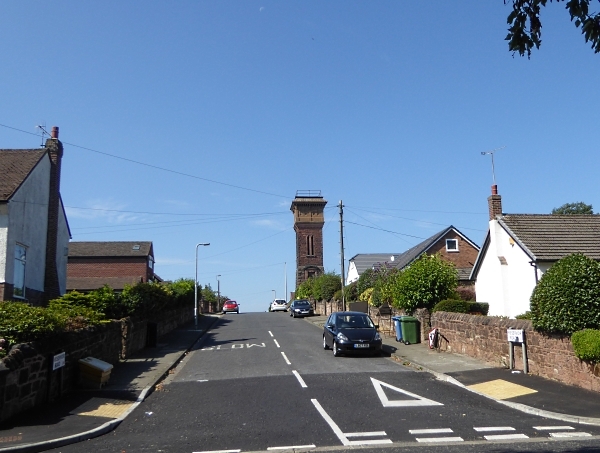 Yet another hot and sunny day, so we ambled slowly down Woolton Hill Road and Church Road, past the water tower on Reservoir Road. That’s the highest point in Liverpool at 292 feet (89 m). On that corner is a pair of old township boundary markers or “mere stones”. They are of unknown date, but probably ancient, and are now very hard to read. 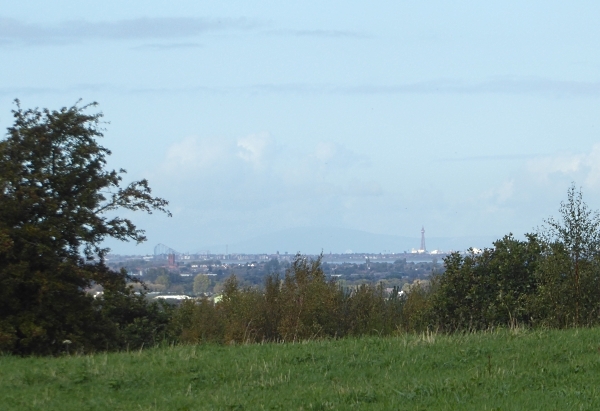 They show Much Woolton on the left and Little Woolton on the right. 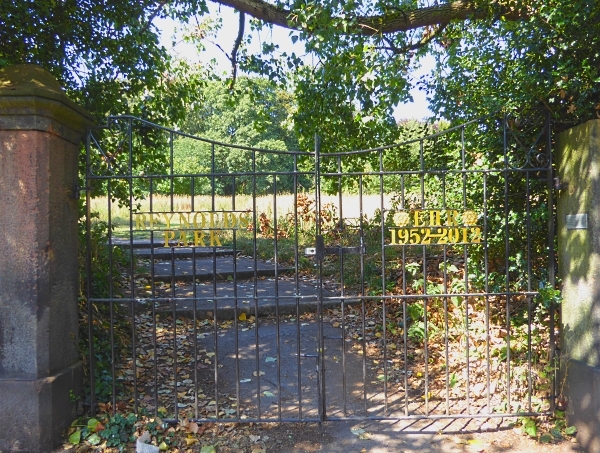 Reynolds Park in Woolton in south Liverpool was once the private 14-acre garden of the wealthy Liverpool cotton traders, the Reynolds family. The last owner gave it to the city in 1929 and it is now a very well-manicured little public park. 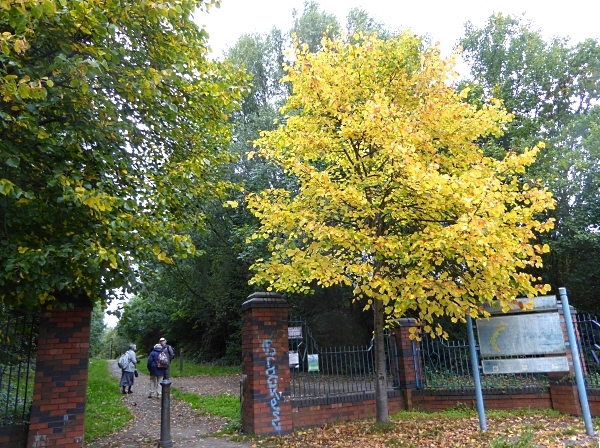 There is a published tree trail, and we spotted many of their signposted trees as we went around – Common Walnut with lots of seeds, an elegant Black Walnut, some oaks and an Italian Alder. 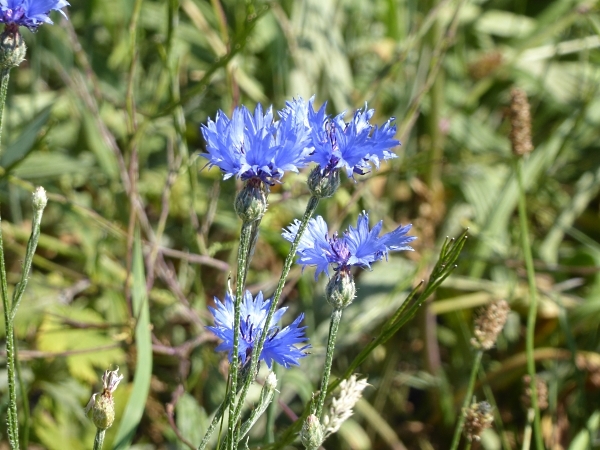 At the eastern end they have planted a wildflower meadow, and we noted Cornflower, Toadflax, Teasel, Ragwort, Corn Marigold, Bird’s Foot Trefoil, Ragwort, Wild Carrot and a new one on me, Sneezewort, also known as Bachelor’s Buttons. 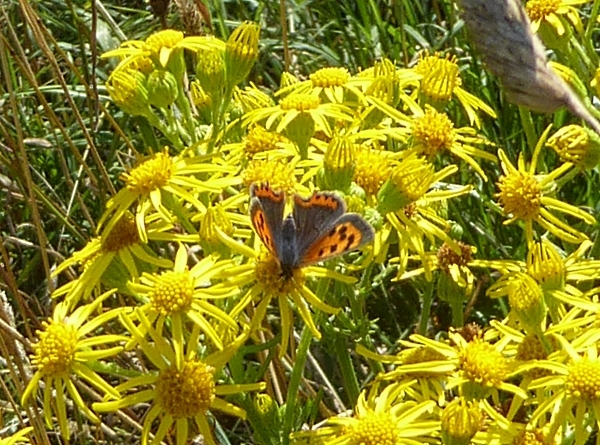 Several butterflies were flitting about over the meadow, including some whites, a probable Common Blue and this lovely Small Copper on a Ragwort. At the far eastern end are the splendid Queen’s Jubilee gates, installed in 2012 to commemorate the 60th anniversary of her reign. Overhanging the Jubilee gates is a big old Poplar tree. 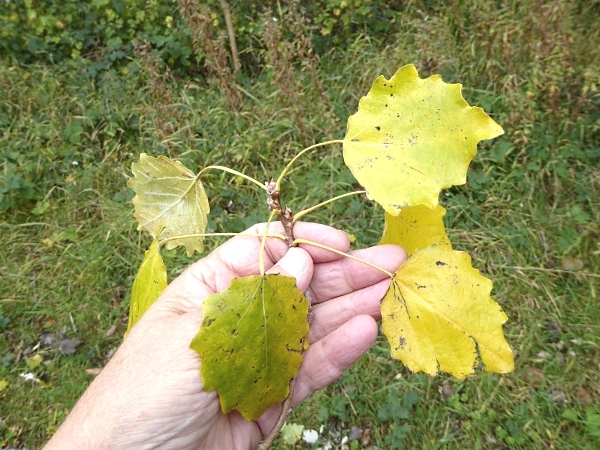 Is that a rare native Black Poplar, or the more common hybrid? In 18th century France the Black Poplar met the American Eastern Cottonwood, and now there are very few pure Black Poplars left. The hybrid is said to be taller and straighter than the native, and this tree was definitely low and spreading, suggesting a native. The other distinguishing feature is that the hybrid has no burrs on its trunk. Sadly, we didn’t look that closely, so we can’t be sure which it is. 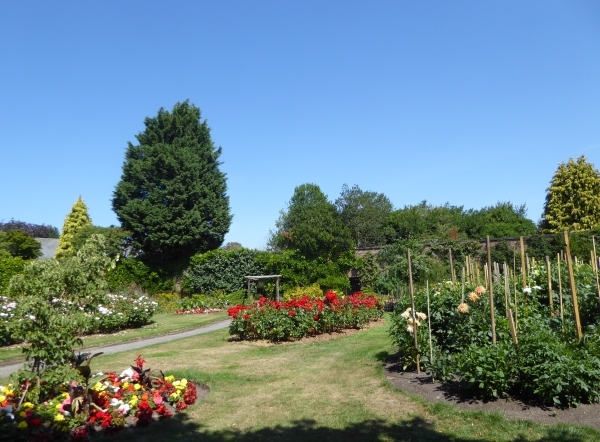 We lunched in the magnificent Walled Garden, a sun-trap of roses, dahlias and a colourful herbaceous border. 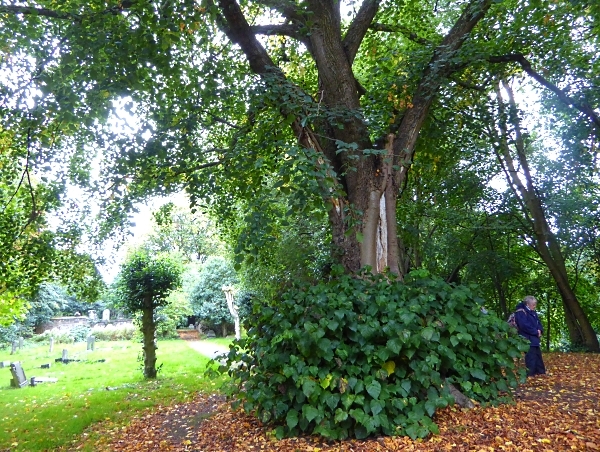 There are several notable trees here, including a Tulip Tree, a Chinese Dogwood, a huge Judas Tree by one of the gateways and a young Indian Bean. Outside, on the sunken lawn below the ha-ha there is a collection of specimen trees, including several Sweetgum Liquidambar styraciflua and a wilting Persian Ironwood Persica parrotia. 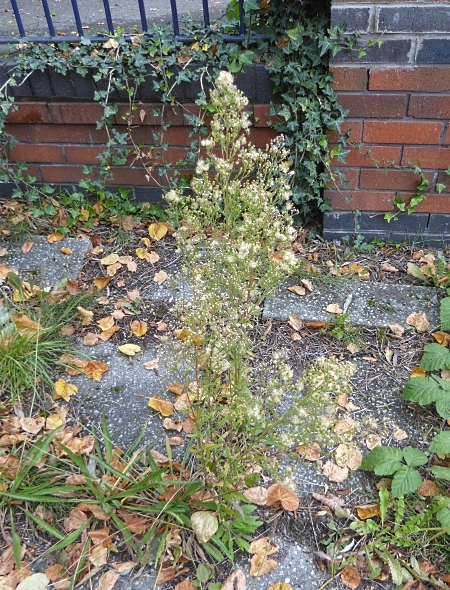 It is known for its magnificent bronze autumn colour, but it’s hard to tell if this one is just suffering from the drought or starting to turn for the autumn. There was a young Pin Oak Quercus palustris in an upright cage. 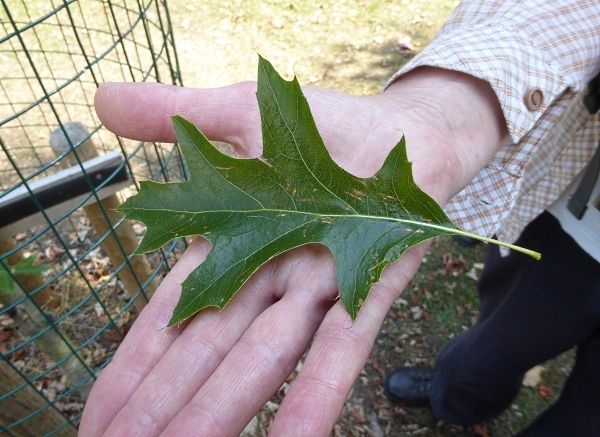 The leaf is obviously oak-like, but deeply indented with points or pins at the ends of the lobes. I’ve never seen or heard of an upright or “fastigiate” variety, as this one appeared to be, and there are none mentioned in my tree books, so maybe this one will grow outwards as it matures. The final tree tick for the day was an Antarctic Beech Nothofagus antarctica, with tiny leaves about an inch (2.5 cm) long and seed cases only a quarter of an inch (7 mm) across. It appears to have fruited well in this hot summer. 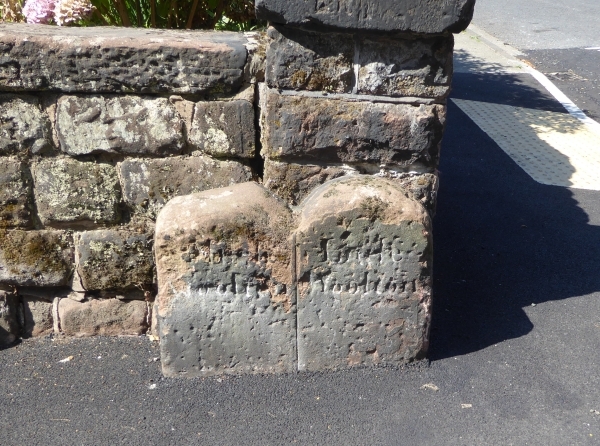 Then we walked down Church Road to Woolton Village for the bus. 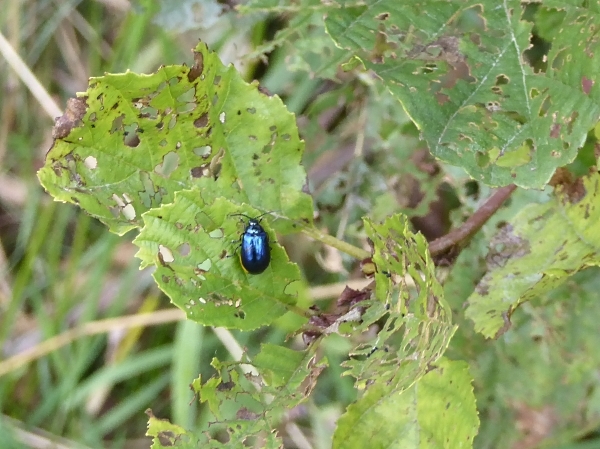 We often see hordes of “Beatle” tourists about in Woolton, but there were none today. Public transport details: Bus 75 from Great Charlotte Street at 10.06, arriving Woolton Road / Rockbourne Road at 10.30. Returned from Woolton Village on the 75 at 2.05, arriving City Centre at 2.25.